Surf Blog - Legendary surf spot Nazaré - the biggest wave ever surfed. Legendary surf spot Nazaré - the biggest wave ever surfed. Why: The biggest wave ever surfed. Tucked in under a steep cliff face on the Portuguese coats is the small fishing village of Nazaré. Home to a population of about 15,000 and one leviathan! ‘Big Mama’ as she is known as, is the biggest wave ever surfed; measuring 100ft from trough to peak. Nazaré - The Biggest wave every surfed measuring 100ft. 28th January 2013 – a day never to be forgotten by infamous board rider; Garrett McNamara. For on that day, taking the cue from his wife (on shore with a walkie talkie calling the sets), McNamara carved a big scar across the sheer 100ft face of the wave and deep into the record books. So what is it about this legendary Portuguese village on the edge of the Atlantic that draws such great interest with each passing winter? The contours of the approaching seabed play a key part. Farol de Nazaré offers clue. The lighthouse is sits above the end of Nazaré’s 230km long underwater canyon. Cold North Atlantic swell surges out of the canyon from a depth of up to 5000m, instantly doubling the wave above it as it displaces a phenomenal body of water. North Atlantic storms arrive on cue all winter long creating an absolutely frightening wave train that few have sought to surf. Tucked in each set lies the rogue wave. Each winter sees scores of storm chasing photographers flock to Farol de Nazaré in a bid to capture the raw beauty that is a storm swept Atlantic coast of Portugal. From this, photos of ‘Big Mama’ went viral. Cue the arrival of GMac and his peers. Far from an occasional rogue wave. Nazaré’s Praia do Norte is home to the biggest wave ever surfed. It’s under scrutiny from top European oceanographers. a)	Weather window: October – February. b)	Nazaré Canyon – a deep water funnel that ends right under Farol de Nazaré. c)	Heavy low pressure systems coming south from Ireland – driving the swell to Portugal. The World’s best surfers - surfing Nazaré. Ever since 2013, when he broke his then record that he had set in 2011 on a 78ft wave, there have been many challengers. Within a year Brazil’s Carlos Burle rode an absolute monster wave. His achievement all the more impressive as earlier that day he’d rescued an unconscious Maya Gabeira from the foam after her near fatal wipe-out. Her recovery and return to the water are testament to her character. True to form, she is back in Nazaré and has her eyes on the being the first female to conquer the biggest wave ever surfed. Benjamin Sanchis’ epic wipe-out on the wave saw him entered into the XXL Big Wave Awards. Europe's own - Al Mennie and Andrew Cotton have surfed Big Mama. This year sees Nazaré’s Praia do Norte added to World Surf League’s 2016/17 Big Wave Tour.Over the coming months we can expect winter storms, recording breaking waves and a line-up of the top big wave surfers. While Lituya Bay in Alaska comfortably holds the record for the biggest wave ever recorded, Nazaré holds the record for the biggest waves ever surfed.Far from sending you into certain death, we’d recommend you first surf Praia de Nazaré. A long sandy beach that skirts the edge of the town. Surf in all tides with a nice peaky beach break ranging from 3-20ft. 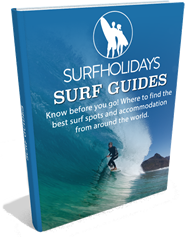 In the summer it’s a perfect spot for beginners learning how to surf, and in the autumn great for intermediates and advanced looking to progress. 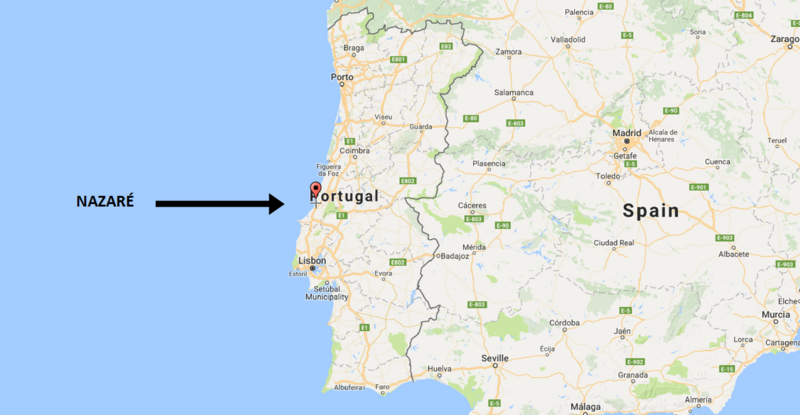 How to get to Nazaré. Nazaré is situated 75 miles north of Lisbon.If you plan on surfing the monster wave or are just keen to take a surf holiday in Nazaré and surf the ‘normal’ size waves down the beach, the nearest airport is Lisbon, 124 km south. The drive up takes an hour and 30 minutes. The town is located in the region known by Portuguese as ‘Oeste’ (West Portugal). 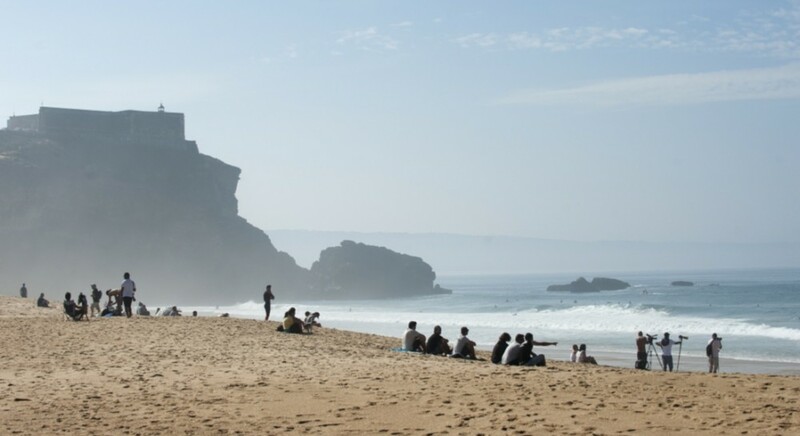 A surf holiday in Nazaré is a unique experience, it’s a traditional fishing village that comes alive in the summer. Far from the big cities and major restaurant & shopping chains, you will experience rural Portugal at its best. To capture the beauty of the area, we recommend taking the 100yr old funicular up to Sítio. The surrounding countryside is unspoilt and the locals will make you feel right at home. Hard to leave!